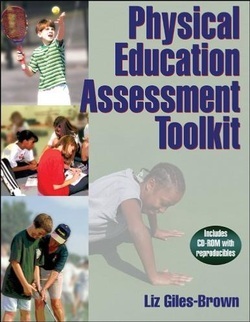 Written by Liz Giles-Brown and published in 2006 by Human Kinetics, "Toolkit" is a comprehensive assessment resource for elementary and middle school physical education. CD of all assessment templates is included. Loaded with assessment templates and sample units, the Physical Education Assessment Toolkit provides you with everything you need in order to simultaneously assess and teach students the lifelong value of physical education. A great resource for elementary and middle school physical educators in grades 3 through 9.